Many a good CD is potentially ruined by a poor booklet inside the brittle jewel case (which is becoming obssolete and often arrives broken, damaged in transit). - and today I read, in a booklet from Italy, - - e i 20" di immobilita etc translated as twenty minutes of immobility with the conductor holding his arms raised, would you believe? That one has much else wrong, which I detail below; sufficient to put off buyers browsing the contemporary music shelf (if they find it at the back of a record shop) and are allowed to open it. It is taken as an example, but its faults are commonplace. Japanese-English had long been a joke, but similar solecisms in Europe are inexcusable. So many booklets seem not to have been proof-read, nor 'designed' with any thought. It is axiomatic, long since, that translations should be allotted to, and especially proof-read by, native speakers of the translated language. See also below (P.P.S.) discussion of one of 17th Century Italian Love Songs, in which it is impossible to access both the original Italian and the English translation together, thereby completely vitiating the possibility of recommending the disc to others than fluent Italian speakers. Only one common fault is avoided in the booklet under consideration as an example of world-wide sinning. It is good black-on-white print, and on glossy paper, a mercy for people with less than pristine perfect eyesight, who are stymied by some of the colour mixes and trendy over-printing which ensure illegibility. This one has an additional common fault, presumably accepted by the composer/writers, who may have written their own notes in some haste, that despite excessively small print there is virtually no paragraphing. Why do I say all this is unnecessary? There is palpable waste of space. The present example has 20 pages in all; many CD inserts do far better with far fewer! The personnel involved takes up one of them in large print – without the booklet's editor being named; half a page would suffice amply to give the information due prominence. 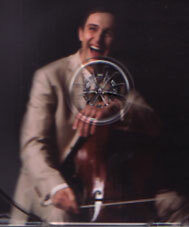 The composer's big cover photo on the front cover is duplicated with the same image, shown larger and perfectly placed on the inlay tray – not as if a target on a dartboard (pace my colleague) – and there is another shot of him - obviously smiling to order for the camera – taking up the whole of p.4. The issues raised here are rarely discussed. Cost figures, of course, but such arguments are belied by the superbly compiled and edited booklets provided regularly by certain firms. Comments by readers would be welcome, including favourite model booklets, of which there are many from companies that pride themselves on taking trouble. P.S. See my analysis of the latest example of crass CD presentation to come my way; Catherine Bott's Convivencia: cover with title in the top left hand corner below? Can you read it? Yes, the record number really is to be found, if not seen, there ! P.P.S. Inaccessible translations: good intentions can be ruined by faulty pagination - see Linn's nearly recommendable 17th Century Italian Love Songs in which it is impossible to follow both the Italian originals with the English translations. ** ArtsMusik.de has responded very constructively to my complaint that their latest CD booklet text is so miniscule as to be unreadable. They promptly supplied the booklet as .PDF (which allows for zooming to required size) and have promised to make their notes (Buxtehude Sonatas op.1) available on their website soon. CD booklets and concert programmes - Who are they for? *"Better to be selective" with CVs in CD booklets (and to print the text legibly) suggests the Editor awhatsoever about the music (not even a date for Bax's 1st String Quartet !) and instead devoted a whole page listing appearances before Royalty and celebrities at international venues from Buckingham Palace to Oman! 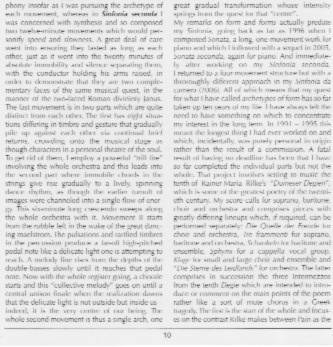 As a music lover, I agree of course 100% that interesting booklet notes, with elucidation of a work, or indeed, its particular interpretation on the disc, is far more likely to benefit my experience than detail on the artists. An exception can be made for deceased artists, where the recording is in some sense a historical document too, especially if the artist was or is now little-known. Otherwise, there are easy ways to find out about artists still active, and the information ready to hand in the physical package of the recording should of course be about the music, or the performers' description of the music. An essay on the music by an acknowledged specialist, or comments on how the artists chose to approach a work can be a delightful bonus to a CD. One might even argue that too full a CV smacks of desperation, and achieves the opposite of its intention. Take the example of a string quartet. Well, a single concert engagement by a string quartet, paid at a healthy industry rate, pays for the cost of pressing a disc (not that of recording it, of course!). Conversely, an industry standard sales figure for a CD release only brings in as much revenue as - say - two concerts by the quartet in royalties. You might argue that even where the artists are themselves financing the recording, they should do so in a high-minded way, and produce as idealistic a result as they can. Fine, if they have the money. But a recording made to the highest standards can easily cost into five figures. Easy to see that artists might decide that this sort of investment is better spent on self-promotion, like an advertising budget, than on intellectual purity. The issue could be as simple as this: if the recording does not help bring in engagements, there will not be any money to finance any more recordings.... ever. A promoter will not listen to the recording from an academic perspective. If he or she happens to have a personal interest in the music, all the better, but then some knowledge will probably be already present too. You win some and you lose none - you send your CD and the promoter happens to be a specialist in that repertoire and in recognises the specialness of your approach. And the others; well, you are judged on the quality of your playing - what you are playing is of secondary importance. As for too-full CV booklets, you simply never know what will strike a promoter's eye. A simple, modest biography impresses some, but by no means all. Promoters' needs and taste differ compeltely from person to person and from audience to audience. So it makes sense to cram everything in, and trust that readers have good enough eyesight to persevere. We live in a climate where everyone talks themselves up; while a few see through the hype, the danger of modesty is that most do not have time to consider things deeply. Promoters may not even be primarily classical music programmers - or even music programmers! Venues are increasingly "multi-arts". The temptation to "big it up" is almost always irresistible, and sadly - from the purist's viewpoint - more often helpful than not. So the bottom line is - if you want discs with higher intellectual quality in their presentation, find the artists (and record companies) the money to do it. Two oddities reaching me last week prompt a few words more (not reviews) on this topic. From this one I learned that Jamie Walton has all the ability one would hope for, endorsed fulsomely by William Pleeth, who taught him privately - who better? There is a less comprehensive CV than often, but we learn that his CDs reached a year's Top Ten and have accumulated "unanimous praise"; will this note (which does not purport to be a review) alter that next time round? Walton is photgraphed enjoying a joke on the inside centre of the inlay tray, as if he were "a target on a dartboard" (our Ying Chang's “pet hate”). The Australian-born conductor had been a prizewinner more than a decade ago, and performs regularly with the Philharmonia, itself having "the greatest claim to be the UK National Orchestra" - - "it records scores for films, CDs and computer games...". Two copies of the other CD [Déclic 60] arrived from Paris, with Quatuor Ardeo offering an attractive meal of the Debussy and two Mendelssohn quartets - a nice Op 13, from which I guess the Debussy (not heard yet) will be fine too. Indeed, there is nothing at all about any of the music, which is introduced and punctuated by lengthy tracks of applause from a (very) small audience; family and friends mayhap?